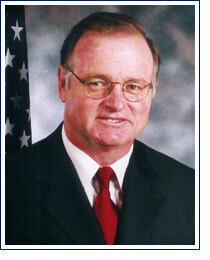 Jerramiah T. Healy, was elected Mayor of the City of Jersey City on November 2, 2004. Jerramiah T. Healy was the fourth of five children born in December 1950 to Irish immigrant parents who met, married, and settled in Jersey City. When they arrived in this country during the Great Depression, Jerramiah's father, Daniel, was a stock boy, and his mother, Catherine, worked as a domestic helper. Years after arriving in this country, the couple became U.S. citizens, and soon after purchased a local tavern in Hudson County. Unfortunately, Healy's father passed away when the boy was five years old, leaving his mother to raise her children in a single parent household. At an early age, Jerramiah Healy was taught a strong work ethic and a sense of family values and moral integrity. These character strengths have played an integral role in his persona in Jersey City throughout his years as a husband, father, and public servant. Healy attended Villanova University in Pennsylvania and helped to pay for his education by working as an ironworker out of Local #45 Ironworker's Union in Jersey City during his breaks from college. He graduated from Villanova in 1972, and went on to attend Seton Hall University School of Law. Healy supported himself by tending bar in Jersey City, and continuing his position as an ironworker at Local 45. After graduating, Healy first entered public life as an assistant prosecutor for the Hudson County Prosecutor's Office in 1977, where he remained until October 1981. During his tenure at the Prosecutor's Office, Healy prosecuted all types of felonies ranging from drug offenses to murder cases. During the past three decades, Jerramiah Healy has worked in various branches of government in cooperation with various administrations. From 1981 to 1991, he engaged in the private practice of law as a sole practitioner handling a variety of cases including criminal defense, real estate, personal injury, and landlord/tenant matters. During a portion of that time, he also worked as an Assistant Corporation Counsel defending various lawsuits filed against the City of Jersey City. In 1991, Healy was appointed Chief Judge in the Jersey City Municipal Court by former Mayor Gerald McCann, and was reappointed by former Mayor Bret Schundler to a second term in 1995. As Chief Judge, Healy not only presided over various hearings and cases, but also supervised nine other municipal court judges. He was responsible for restoring a public defender's program that had been disbanded and for reducing the $45 million backlog of parking tickets issued in Jersey City during his term. In November 1996, Healy ended his tenure as Chief Judge when he decided to make a maverick bid to unseat former Mayor Bret Schundler in the 1997 election. The unprecedented and closely watched campaign resulted in a run off election between Healy and Schundler in which Schundler prevailed in June 1997. In the intervening years, Healy resumed the private practice of law and was elected to the City Council in 2001. He has been an advocate of putting more police on the streets of Jersey City and for cleaning up the litter-strewn streets that are also marked throughout various thoroughfares with potholes. Jerramiah Healy was also chosen as counsel for the Hudson County Government's first Ethical Standard Board which was created by Hudson County Executive Thomas A. De Gise. On a City Council ridden with infighting, Healy was able to cross the political divide with his trademark blend of common sense and bracing honesty which he dispensed from the bench during the early 1990s. Jerramiah Healy has also been a voice in city government for a more judicious use of the city's abatement power. Healy is a proponent of using Jersey City's abatement power to encourage investment and development in places where they otherwise would not be utilized. Healy believes that this use of power could expand the taxable ratable base and relieve some of the property tax pressure on one and two family home owners, while at the same time bring much needed investment and jobs to the city. During his bid for Mayor in the November 2004 special election, Jerramiah Healy gave up his private law practice. Jerramiah T. Healy resides in Jersey City Heights with his wife Maureen, a Jersey City native, who is a Registered Nurse at Jersey City P.S. 12 and the infectious disease nurse for the school district. The couple has four children; Jeremiah, Susanne, Catherine, and Patrick, all of whom were born, raised, and educated in Jersey City.